It's a simple recipe but the secret is the selection of kamoteng kahoy (cassava) to get the perfect, translucent and fudge-like minani. 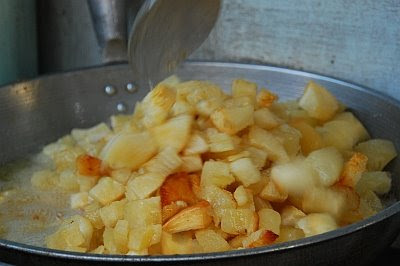 Remember also to soak the diced cassava in water to remove natural cyanide in linamarin form (linamarin protects the cassava plant from predators) usually released into the air when processed. it looks yummy! but i think it's better when there is sugar or isawsaw sa sugar. Tutubi, this looks like a good way to eat cassava. I should try this next time I see fresh cassava in the market. I dont believe we have this in my province and I have not seen this in Manila either. Thanks for sharing. OMG, you made me feel hungry again. i missed minani... sayang i wasn't able to taste it again when I was in paete during holy week. Looks very luscious to me; and it's certainly very nutritious. this is a very interesting way to eat cassava.looks yummy and also exotic in a way. i only know cassava cake or boiled cassava with coconut milk. btw, you have an interesting blog. i got here thru lifecruiser's blog. will sure come back for more. Cassava with vinegar? I wonder how that tastes like. Sarap! Simple but it looks delicious. 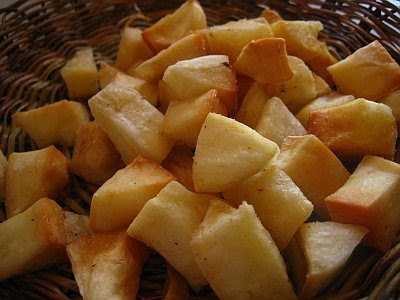 However, cassava reminds me of tapioca though. I was in Paete last Saturday. I'll definitely try this delicacy the next time I visit your town. Thanks for sharing this info. meron pala ganito sa Paete. I'll try to taste this one when I get to go back. I've never seen that before and it looks really delicious. I love anything crunchy and with garlic. Nice name... minani... so it's only like peanuts, right? But no peanuts in it because it's actually made of cassava... very interesting. I've passed by Paete several times and with this post about "Minani", I will make it a point to look for one next time. Thanks! Uy! Naka D80 na sya. Paired pa with a 18-200 VR! HEhe. Sweet! My first time to hear of minani or fried cassava. It looks good. Perhaps I should try making it. We have cassava in our local market here. yup, prepared and cooked like peanuts complete with lots of garlic. botits, i wonder if "ginataang kamote" (cassava simmered on coconut milk) could be considered as another one of our unique foods. but i have not eaten it anywhere else except in our town. my dada (granparents) used to cooked if very slowly on a kalan de uling. the more slowly it cooks the better the taste until it is simmering on it's own coconut oil (nagmamantika sa gata). i hope you can post some pictures with a more meaningful description, or, if you have posted already (sorry naman) just please link me. Oh, yes. I'm sorry, it's a barangay in Majayjay municipality. clean, safety, presentable street food vendors in Metro Manila. Street food vendors in the Philippines should use more locally produce naturally grown herbs and green leafy vegetables (preferably not overcooked). Next Christmas and New Year Season dapat ang paggamit ng mga firecrackers ay concentrated lang sa isa or dalawang areas lang per city. Marami ring na-scare na mga turista sa mga pagpapaputok - tapos hindi pa environmentally friendly. Na-Scare din natin iyong mga migratory birds - eh iyan pa naman ang pinupromote ng Department of Tourism. Personally, I say MSG - Monosodium Glutamate - is toxic, rock salt/natural salt is better. Simpleng Timpla (na nakalagay sa bottle) ay puwede ring magamit ng mga food vendors. Street foods. Mas gusto ko talaga iyong pancit palabok na walang MSG. Let's also promote our local fruits. I forgot the name of this fruit (colored dark brown) and taste like singkamas - recommended for diabetic. There is not much pension houses, guesthouses for backpackers (Foreign and Local)sa Metro Manila at Cebu. Maraming mga vacationing OFWs na gustong pumunta sa Metro Manila at Cebu na naghahanap ng place to stay na very affordable ang mga room rates -something like Thailand is offering to backpackers. Dapat mayroon ding mga testimonials (interviews) na mga Pilipino at mga ibang lahi sa You tube or sa ibang social media tungkol sa kanilang vacation sa Philippines. For 2010 - more electric tricycles, electric jeepneys, electric taxis in the streets of Metro Manila, Cebu, Baguio, Tagaytay, and Davao. Improved transportation - with appropriate bus and jeepney stops. Tapos mae-experience ko iyong pag-pila sa bus stops wow! Clean Pasig river, clean Laguna and Manila Bay. MMDA Chairman Inocentes - excellent job para sa mga street vendors - para ala-Hongkong, Singapore, Thailand type - Galing!!!!! 5 star. Uh I have a first taste of this in Majayjay when my late father use to bring us in his hometown when we are young, been there last January but didnt find somebody selling sayang I want my wife pa naman to taste it baon sana papuntang Taytay falls :). psst! AHA, bat di mo kami pinakain nito nuon when we went to your place! ?